Bluegrass on Badger, a block party thrown in May on Eau Claire’s Eastside Hill, featured live bluegrass music (above), kids’ games, and a food truck (below). A big music-and-food infused block party on Eau Claire’s Badger Avenue grew out of a small idea Josh Rizzo had: “One night as I was playing guitar, I wondered what would happen if I had a band up on this porch.” The porch on the Rizzo family’s Eastside Hill Neighborhood home is modest, but it’s big enough for a four-piece bluegrass band like the one Rizzo jams in with two brothers and his father. From this dream of a little concert on the porch grew the first-ever Bluegrass on Badger, which Josh and Nicole Rizzo hosted May 25. 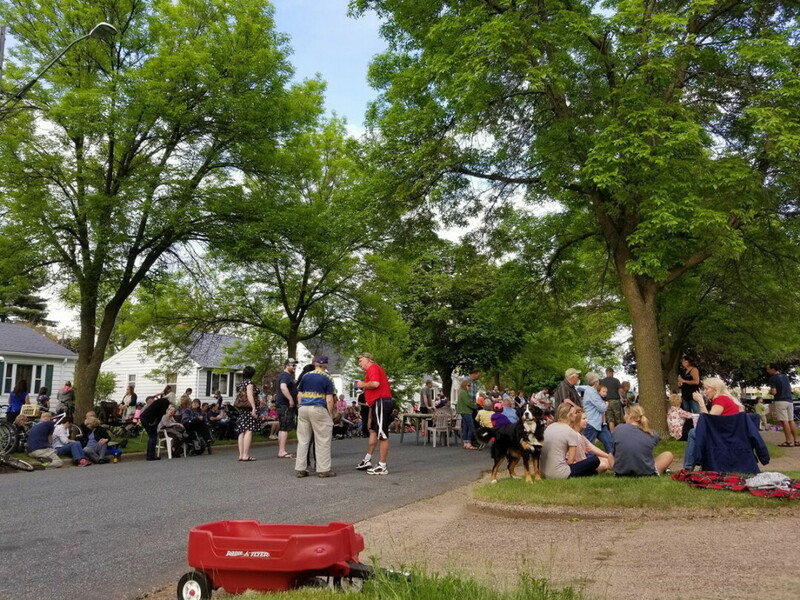 The neighborhood gathering was a success beyond Rizzo’s expectations, and it’s a model for the relative simplicity with which residents can throw block parties in Eau Claire. After picking a date and checking with his neighbors – he was able to reach 17 of the 20 people on the block, and they all were onboard – Rizzo filled out an online application. 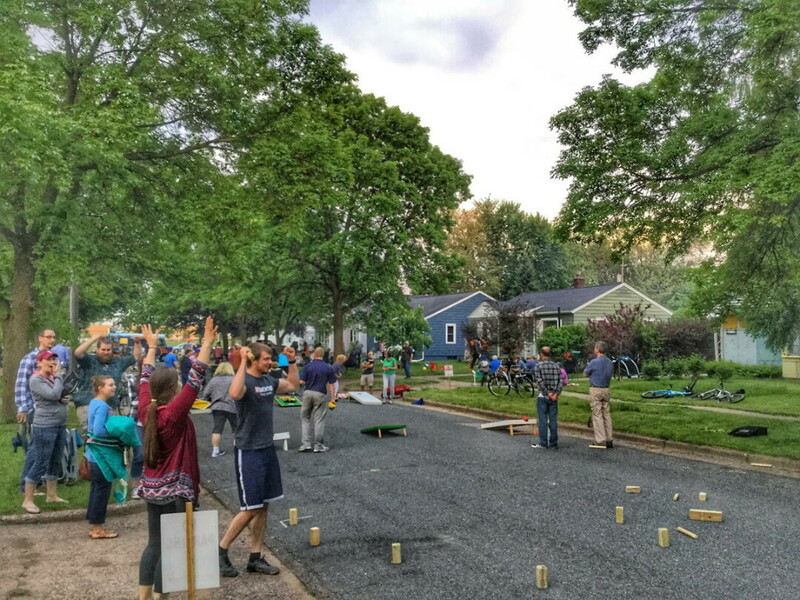 At the appointed time, city workers dropped off barricades, a bag of games, and a kubb set. Rizzo publicized the date, booked the bands, invited a food truck, asked neighbors to bring a few extra yard games, and waited for people to show up. By any measure, the party was a success: That evening, more than 300 people came. Rizzo estimates about one-third were neighbors, one-third friends, and one-third other people who heard about the event and decided to check it out. Those who gathered ranged in age from small children to senior citizens. They ate tacos, listened to music, played bean bags, swung in hammocks, teetered their way across slacklines, and generally socialized with old and new friends and neighbors. When Rizzo invited Gordo’s Food Truck to sell its fresh Mexican fare at the block party, he half expected to be apologizing to them at the end of the night for low turnout. He shouldn’t have worried: Turnout was so high that the truck actually ran out of food! 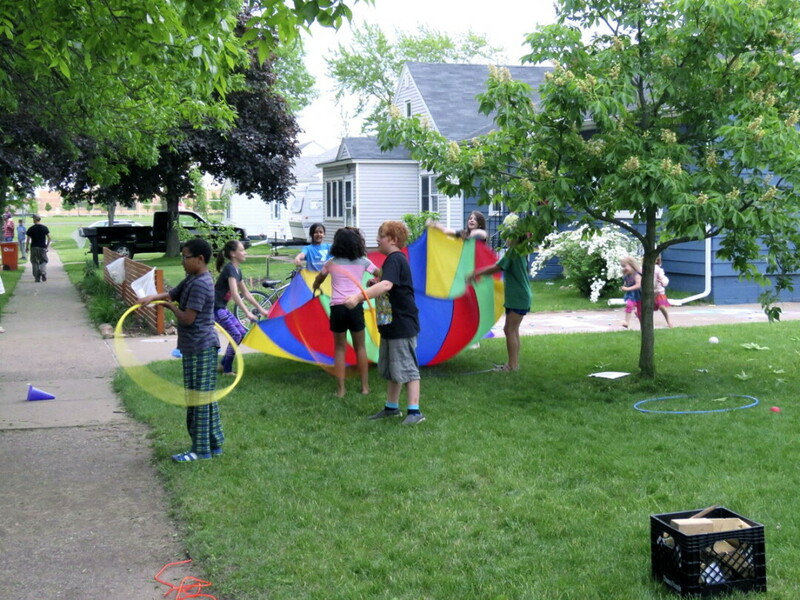 The neighborhood block party can be a simple yet powerful community-building tool. 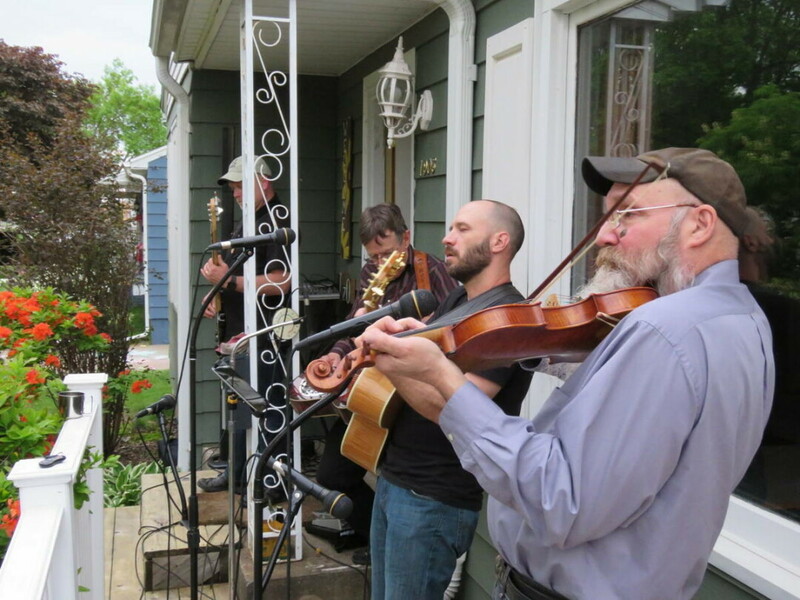 Check out our story “Block Full of Bluegrass,” about a neighbor-created event with music, games, a food truck, and more in late May on Eau Claire’s Eastside Hill. It became an instant breakout success with hundreds in attendance from the immediate neighborhood and beyond. Many municipalities have programs to help foster these kinds of activities and make things easy, and for good reason. Block parties and similar types of hyper-local events can increase the desirability of neighborhoods and raise home values. They can create collaborations among neighbors on initiatives around beautification, safety, and other improvements. And perhaps most important and long lasting, they simply strengthen the connective tissue between neighbors that has generally been on the decline in recent decades across America. As more focus is put on private backyards instead of front-porch neighborliness, as people retreat to their TV screens and Netflix queues, and as they more often talk to neighbors via Facebook than face-to-face, it becomes tougher to have the impromptu moments between neighbors that help build real communities. That’s why these kinds of gatherings – neighborhood-wide thrift sales, picnics, block parties, and others – are so critical to the health of not just our neighborhoods but to entire cities. They are where connections are made and ideas are formed. Where issues and discussed and solutions discovered. It’s all these important things. But it’s also where one neighbor kid can simply have an ice cream cone with another neighbor kid she’s never met before. And that could become the most important connection of all.